London South Bank University (LSBU)’s School of The Built Environment and Architecture is celebrating the fact that two of its recent graduates have been nominated for acclaimed industry awards. Joe Axelrod and Ryan Rodrigues, both graduates of LSBU’s Building Services Engineering course, have received nominations for the RAC Magazine’s National Student of the Year competition and the CIBSE Young Engineers Awards respectively. These awards recognise the best up-and-coming engineers in the country and reward the innovative thinking, hard work and skill potential of graduate engineers. The winner of the National Student of the Year Competition will be announced on 23 September, with the CIBSE Young Engineers Awards announcement taking place in a ceremony held in London on 8 October. 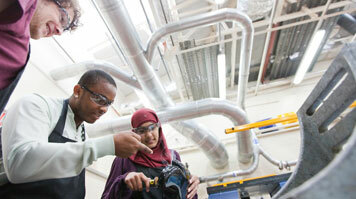 Find out more about studying Building Services Engineering at LSBU.